Following a healthy eating pattern across the lifespan is important. Eating a healthy meal then chasing it down with a soft drink doesn’t really constitute as “healthy”. All food and beverage choices we make matter. Beverages are not always thought of or considered when individuals think about overall food intake. Sugar-sweetened beverages, such as soft drinks, sports drinks, and fruit drinks that are less than 100% juice, can contribute excess calories while providing few or no key nutrients. Added sugars account on average for almost 270 calories, or more than 13 percent of calories per day in the U.S. population. As shown in Figure 2-9, intakes as a percent of calories are particularly high among children, adolescents, and young adults. Americans should get less than 10 percent of calories per day from added sugars. Beverages account for almost 20 percent of total calorie intake. Beverages—excluding milk and 100% juice–account for almost half (47%) of all added sugars consumed by the U.S. population (Figure 2-10). Within beverages, the largest source of calories is sweetened beverages, accounting for 35 percent of calories from beverages. Sugar-sweetened beverages, such as soft drinks, sports drinks, and fruit drinks that are less than 100% juice, can contribute excess calories while providing few or no key nutrients. One of the major recommendations in the 2015 Dietary Guidelines for Americans recommend limiting added sugars to no more than 10 percent of total calories—or 12 teaspoons per day–based on a 2000 calorie diet. A 12-ounce soda packs in about 150 sugar calories and 10 teaspoons of added sugars—nearly all the sugar you need in a day! Drinking water is the perfect way to get our daily fluids. Getting the right amount of fluids could be the difference between feeling energized or feeling drained. Staying well hydrated is important to both physical performance and mental cognition. (Popkin) Drinking water instead of sugar-sweetened beverages is one of the easiest ways to meet the recommendations to limit added sugars because sugar sweetened beverages are the leading source of added sugars in the U.S. diet. 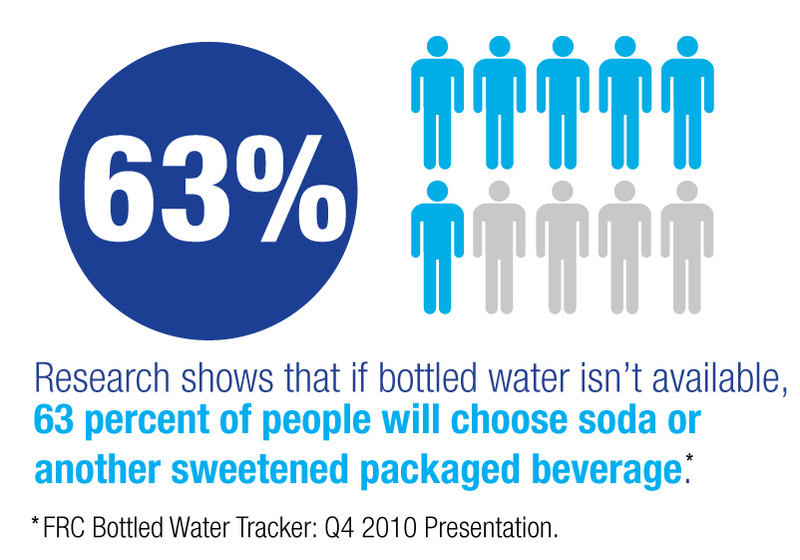 Half of all kids and adults in the U.S. drink at least one sugar-sweetened beverage every day. Calories from sugar-sweetened beverages total about 170 calories—equal to more than 10 teaspoons of sugar. (Johnson/Neuhouser) People often forget how many calories and sugars are in beverages. They watch what they eat—not what they drink. Replacing one 12-oz soda with water each day would cut some 50,000 calories from the diet and about 75 cups of sugar in a year! Keeping tap or bottled water on hand and accessible is an easy way to remind yourself to drink calorie- and sugar-free water in place of sugary beverages. Replacing just one sugary beverage per day with water is a small step that can equal big calorie savings and may be a dieter’s best ally. Sparkling and still water are terrific options for people seeking simple, natural refreshment who no longer want the added chemicals in diet soda. When eating out or entertaining, sparkling water is a great alternative to sugary beverages or high-calorie alcoholic beverages. One of my favorites is Poland Springs Sparkling Water with a squeeze of lime! 2. Johnson RK, Appel LJ, Brands M, et al. Dietary sugars intake and cardiovascular health.” A Scientific Statement from theAmerican Heart Association. Circulation. 2009;120:1011-20. The sugars in soda are frightening. And people are out here drinking 32-ounce big gulps.